The defending national champions are scheduled to play three games in three days starting Thanksgiving day in the Vancouver (British Columbia) Showcase. Top-ranked Notre Dame’s opening game — at 3pm Eastern on Thursday — will be against Gonzaga. If the Irish win the first contest, they will play Friday against the winner of the Rutgers-Drake game. The other side of the bracket includes Oregon State, currently ranked 9th, and 13th-ranked South Carolina. The Gamecocks dropped out of the top ten this week following a 25 point drubbing by Maryland over the weekend. South Carolina had been ranked in the top ten for 89 consecutive weeks dating back to 2014. Gonzaga is currently 4 and 0 with victories over Montana, Eastern Washington, Idaho State and UNLV. The Bulldogs are coming off a strong 27-6 season. After winning the West Coast Conference championship, Gonzaga lost to Stanford, 82-64, in the first round of the NCAA tournament. The Zags have been selected to win the WCC for the sixth straight season. They’ve won 13 of 14 conference titles. The Zags feature balanced scoring and are led by three seniors — Chandler Smith, a 6’ guard, Zykera Rice, a 6’1” forward, and Laura Stockton, a 5'8” guard and the daughter of Gonzaga and NBA star, John Stockton. Smith and Rice both average 10.8 points per game over the first four games, while Stockton has chipped in an average of 9.0 points and 4.2 assists per game. Zykera is averaging 8.3 rebounds, and Chandler adds 6.0 boards. Through the first four games, non-starter, Jill Townsend, a 5’11” guard, leads the Zags in scoring at 11.0 points per game. Katie Campbell, a 5’10” guard, adds another 10.3 points off the bench. Campbell and Townsend have combined to make 11 of 23 shots from beyond the arc (47.8%). The rest of the Zags have only hit 6 of 37 (16.2%). Through the first four games, Gonzaga is averaging 69.8 points per game vs. their opponents 53.2. They are shooting 41.7% overall and just 28.3% from three. They make 4.3 three-point field goals per game. The Irish are currently averaging 93.0 points per game following Saturday’s 101-77 win at DePaul. Notre Dame is shooting 53.8% from the field overall and 58.0% from two-point range. Without Marina Mabrey, Notre Dame has only made 7of 26 three-point shots (26.9%). The Irish have only taken 8.7 three-point shots on average and only made 2.3 per game over the first three games of the season. Arike Ogunbowale is averaging 25.0 points per game. 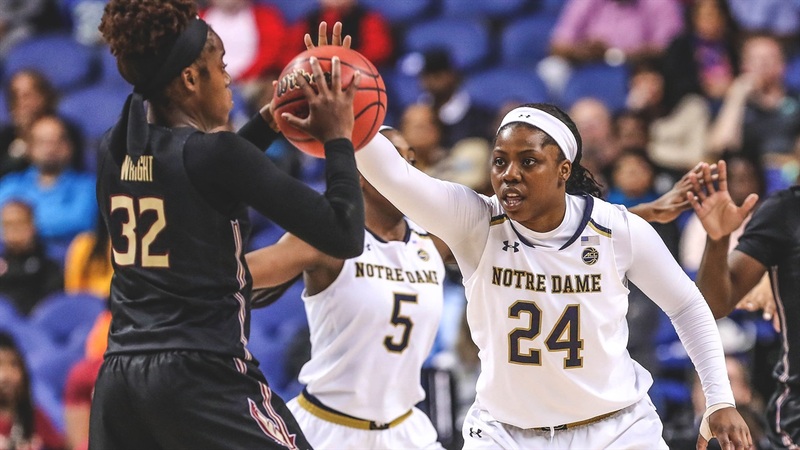 She averaged 20.8 last season — the first Irish player to average more than 20 points per game in 20 years. Ogunbowale missed her first free throw of the season vs. DePaul after going 15 for 15 in the first two contests. She’s now made 22 of 23 (95.7%). Jessica Shepard has averaged 20 points per game and adds 10.7 rebounds per contest. She’s hitting 64.3% of her shots. Jackie Young led the Irish against DePaul with 28 points and 12 rebounds. She’s averaging 16 points per game, 8.3 rebounds and 3.7 assists. She’s connected on 65.2% of her two-point field goal attempts and 92.3% from the line. Brianna Turner adds another 11.7 points and 8.3 rebounds per game for the Irish. Freshman point guard Jordan Nixon is starting in Mabrey’s absence. Her current focus is on passing and not scoring. She’s only taken six shots across the first three games, although she did go 3 for 3 from the field against DePaul. She’s averaging just over 25 minutes per game. Freshman guard, Abby Prohaska, has apparently gained Coach Muffet McGraw’s trust in the early going. She’s averaging 21 minutes a game coming off the bench. While she’s only averaging 3.3 points per game, she defends well, knows where she needs to be on offense, and so far hasn’t made glaring errors. The Irish turned the ball over 25 times in Saturday’s win at DePaul. Prohaska had no turnovers in her 26 minutes on the floor. She also chipped in with four points, two rebounds, four assists, and four steals. She’s six for six from the free throw line over the three games. Forward Dani Patterson was a second off-the-bench standout in the DePaul game. She scored 14 points — 5 for 6 from the field and 4 for 4 from the line — in 22 minutes. She also blocked three shots. After this week’s tourney, the Irish return home to take on 12th-ranked Iowa in the ACC - Big 10 challenge on Thursday evening, the 29th, followed by the home contest against 2nd-ranked UConn on Sunday afternoon, December 2nd. There will be no free television or streaming of the Vancouver Showcase. However, two pay options are available — $9.95 for a single game and $24.95 for every game in the three-day event. The full tourney price includes both live and on-demand viewing.